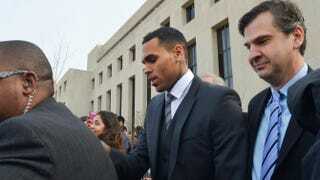 Chris Brown leaves court with his attorneys. Singer Chris Brown has rejected a deal that would have required that he plead guilty to misdemeanor assault charges, stemming from an altercation that led to the singer's arrest outside of a Washington, D.C., hotel, the Associated Press reports. Danny Onorato, one of Brown's lawyers, told AP outside of court that the attorneys rejected the deal because Brown is not guilty. Brown, who has lost the blond coif he was sporting when arrested in October for the altercation, appeared with his on-again-off-again girlfriend, Karreuche Tran. He wore a three-piece charcoal-gray suit and did not speak during the less than 10-minute hearing, AP reports. Prosecutors said in court they will be turning over substantial video surveillance shortly, but did not say what it shows. The R&B singer was arrested after he and his bodyguard, Christopher Hollosy, who also faces assault charges, allegedly struck a man who tried to jump in a photo Brown was taking with two friends. Hollosy's lawyer says he rejected the same deal that Brown was offered, AP reports. According to the New York Daily News, Brown is currently undergoing court-ordered anger-management rehab in California, after the Los Angeles County judge on an earlier assault case, in which singer Rihanna was the victim, reviewed his Washington police report and revoked his probation last month. The L.A. judge had Brown attend 90 days of residential treatment and recommended that he take all medications prescribed by his doctors. "I couldn't be happier with his progress, how he looks, his skill set," Mark Geragos, Brown's lawyer, told the Daily News in an exclusive interview Wednesday. "I'm very proud of him." The Grammy winner voluntarily checked into rehab for anger management days after he pleaded not guilty to the reduced misdemeanor charge in October, and was temporarily kicked out Nov. 10 for hurling a rock through a window of his mom's car during a family-therapy session, the Daily News reports. If convicted of the simple assault charge in Washington, Brown faces up to 180 days in jail, prosecutors said. If Brown's Los Angeles judge decides the Washington incident violated his probation for his assault against then-girlfriend Rihanna, Brown could get jail time in California, the Daily News reports. Read more at the Associated Press and New York Daily News.